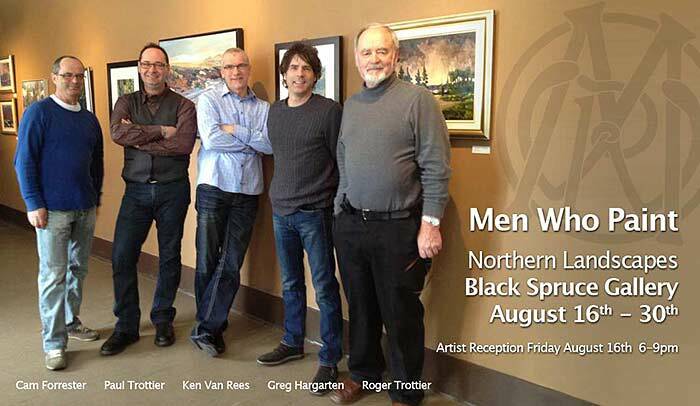 Canadian landscape artists Cam Forrester, Greg Hargarten, Paul Trottier, Roger Trottier and Ken Van Rees, also known as the Men Who Paint, will be hosting a showing of paintings August 16th - 30th at the Black Spruce Gallery at Northside on Highway #2. ‘Northern Landscapes’ will feature pieces by the artists of the Northern Canadian scenes that have become the hallmark of the group. Since their formation in 2007 at the Kenderine Campus at Emma Lake, Men Who Paint have embraced plein air painting. Inspired by the work and adventurous spirit of the early Canadian painters, the group, until recently, has spent most of their painting time outdoors at locations across Canada. In June of 2011 the group was chosen from artists across the country by Parks Canada to paint at Ivvavik National Park in the Yukon Territory. Accompanied by Parks Canada staff and a camp cook, the Men Who Paint were based at the Sheep Creek Warden station on the Firth River. There they spent 10 days in tents, visiting various locations on foot, or in some instances by helicopter, to document the National Park which borders Alaska and the Beaufort Sea. Of the over 100 works painted in Ivvavik, 60 of the most engaging have been reproduced in a new book. Halfway to Heaven documents the Men Who Paint’s artistic journey though the remote Ivvavik National Park with reproductions of the paintings done on site and photographs of the the National Park (which sees fewer than 100 visitors a year, including Park staff). Halfway to Heaven is now available online here.